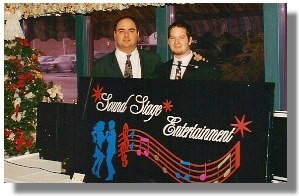 Sound Stage Entertainment - karaoke in the Cleveland and Akron area. Disc Jockeys in Akron, Cleveland, Canton, and all surrounding areas in Ohio. Come see why Akron, Cleveland, and Canton prefers Sound Stage. When it comes to Karaoke Entertainment, Sound Stage is your true professional. Our Karaoke systems carry over 2,500 songs for your guests or customers to choose from. We have one of the largest karaoke music libraries anywhere! If you are a bar, night club, or restaurant owner, karaoke can be a fantastic way to increase revenue on those "not so great" nights. You will find that by advertising that you have Sound Stage Karaoke, you might even capture a whole new customer base! We also offer karaoke as an add on to any of our spectacular disc jockey shows at just a small add on to our package rate. Call us now to check our karaoke availability! We have very special pricing for your weeknight Karaoke Event. Please call us to find out just how affordable it can be to bring new customers in with Live Laser Karaoke.